One of the great things about living here in Utah is that there are always LDS to talk with right next to you! It's funny how LDS, at least here in UT, talk like everyone around them must be LDS. I'm in the steam room at the gym one morning, and this older guy is talking to this older woman about the Hobby Lobby case, the cross on Mt. Soledad in San Diego, and how this is a Christian nation, and if you don't like it... there's the door. Then he starts talking about his bishop and food storage. Yada, yada, yada. So I say, "You must be LDS?" They both say yes, so I bomb the conversation by asking, "Why?" The woman says, "It's the Church of Jesus Christ." I said, "Which Jesus and how do you know it's not a false one?" She said, "There's only one." I said, "Jesus taught there would be false Christs in the last days" (Mat. 24:24). She said, "It's just my feeling." The older guy takes off, but I had a great talk with the older woman explaining from the Bible how Mormonism teaches a false god and Christ and how deceptive feelings are. She was very intently listening to everything I had to say, so please pray that God would draw her to Himself. I see her every once in a while at the gym. Right after this encounter, we went to Idaho for Tara’s grandmother’s funeral. She was buried with her temple clothing on, including her fig leaf apron, and she had her temple recommend in her hand. LDS need that recommend in order to go through the temple, and one needs the temple in order to perform all the ordinances that are required for entrance into the highest heaven where God dwells. For the LDS woman, her entrance there also requires her husband to be worthy and to call her up on the morning of the resurrection. The burden and lack of assurance or peace with God here was only amplified by the family hymn she requested to be sung. The popular LDS hymn “I am a Child of God” was sung by the entire family at the end of the ceremony. The chorus was “teach me all that I must do to live with him someday.” While Tara was out entertaining Zoe, I stood with the family, but refused to sing this ungodly song. Tara and I witnessed to a couple sister missionaries who were walking across the street from our home one day last month when I was doing yard work. (They never come to our home!) It was good for them, but it was timely encouragement for Tara. She had never witnessed to sister missionaries before and found them to be so much easier than guys. They had little more to prove their faith other than pointing to the fruit of the Spirit. After I demonstrated how insufficient that was for us (since we also claim to have the fruit of the Spirit, but we can’t both be right), one of the missionaries asked who the “other sheep” were in John 10:16. After I demonstrated from the text that they weren’t Native Americans specifically, but Gentiles, and that includes Native Americans, the missionaries had nothing really more to say. So we got to freely share with them the good news and how deceptive Mormonism is. Just before this, Tara was having a difficult time with other Christians getting on her case for supporting me when I publicly called a so-called Christian brother to repentance for publicizing his own sin and not giving a rip about it since he's happy! After our time with the LDS missionaries, God sent another guy on the internet to inquire about Tara’s faith, and he recently left the LDS Church. It was quite a spiritual warfare day! 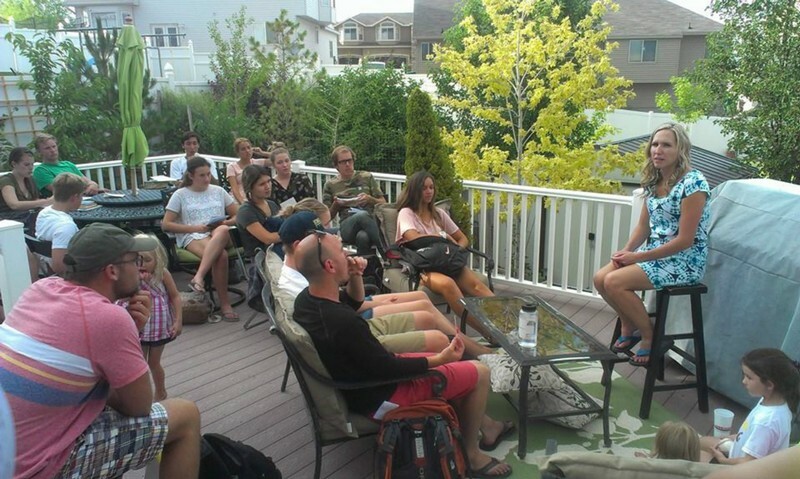 We hosted another mission team at our home last month for a barbecue. This team was from our board member Brett Kunkle’s church in California. We fed them, then I shared some things about our ministry and things to keep in mind as they minister up here. After that, Tara shared her testimony with them. Keep in mind that we’d like to do the same for your church mission team! Speaking of Tara sharing her story, she was also able to do that on former Mormon Bishop’s Earl Erskine’s TV show. This will air locally on October 17th as well as the 21st, and then on the internet for the world to see. We had a different sort of Meetup last month. 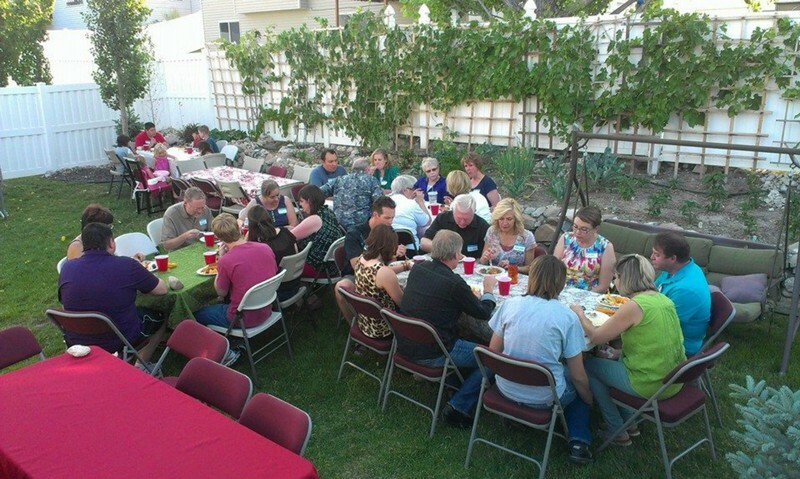 We hosted a Meetup for the From Mormonism to Christianity Facebook group at our home. People came from all over America for the 3-day event. We had a potluck at our home, then Tara shared her story and I shared about several statements that LDS make to trip Christians up. The next day, I had arranged for the group to meet at our local church for a time to hear various speakers. I was also in charge of the Q&A time at the end of the event, which hosted all the speakers. Jeff and Doug at the St. George JW ConventionI was able to advertise our JWinfo.org web site at the end of a couple Jehovah’s Witness conventions in Ogden, UT. Jehovah’s Witnesses are more difficult than LDS to get into conversations. This is why the best way to reach many of them is to get outside their conventions and advertise web sites. As a case in point, the only real conversation I got into was with an LDS guy, who stopped to chat with me out of his car. 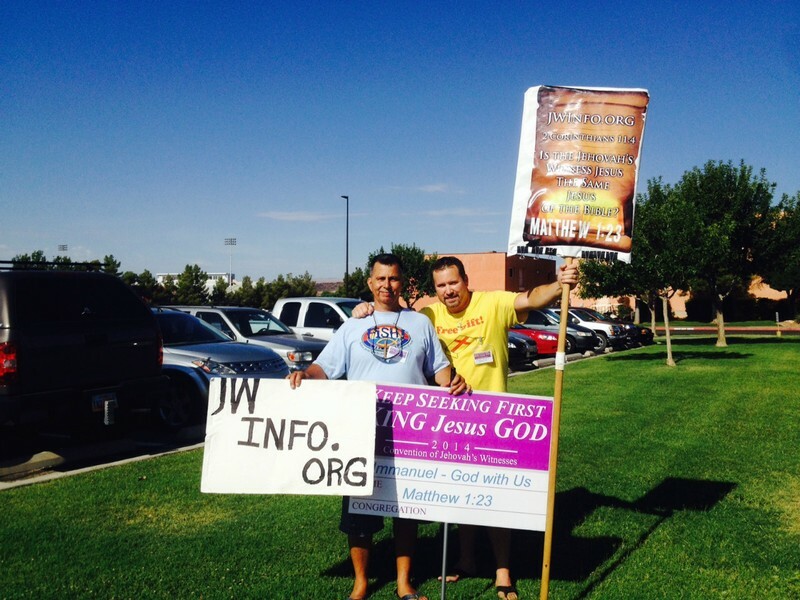 During this same time, I had a couple buddies advertise JWinfo.org outside a convention in St. George, UT. I wasn’t able to go to the Hill Cumorah Pageant in upstate New York, but someone was advertising our JosephLied.com web site there! We not only need your prayers, but we need your financial assistance as well. Keep in mind that your investment is not simply for us, but for the lives of others we reach with the gospel. The standard way to financially invest is by writing a check to Courageous Christians United (CCU). For more information on various ways to invest in this ministry, including online giving, please see our “Invest” page on any of our sites. Please keep in mind 1) this is our sole source for income, and 2) we have no financial guarantees each month. Ministry partners come and go as jobs do. If you’re not a partner, please consider joining our team and let us know soon. We’d love to be your missionaries here in Utah. Many thanks to those of you who hold us up in prayer and in your financial giving! We expect God to provide for our needs through you. Why? Because the Bible is clear: “the Lord has commanded that those who preach the gospel should receive their living from the gospel” (1 Cor. 9:14). Be strong and courageous (Joshua 1:6)! I must say that you are ingenious--I love that flashing sign on your back---great preaching. You guys are so mean to mormos rediculis !! [I replied:] Well we never thought of warning people as being mean. The fact of the matter is that Mormonism is false, it leads one away from God, and people need to be warned. It was another great trip. The group loved kicking it off with your training and Tara's testimony. Thanks for your contribution! Rob, I just got your letter in the mail & I brought it into office so I can finish reading it! It is really choc full of so much news & I love reading all you & Tara have to say about your privileged work there in Utah. It’s always a pleasure to read your news after any place you all have been sharing the REAL TRUTH with the Mormon folks who have been/still are being deceived. We never get this info on news, so welcome it coming from a truthful source (YOU). It was good to know your little girls got to come with Tara to be with you & give you family support. You are blessing the LORD with your persistence of carrying on His Word to the lost folks all wrapped up in Mormonism. I’m praying for many minds/hearts to be open to God’s TRUTH as you all present it. I admire you so much for your dedication to God’s work. May God bless you and keep you safe. Rob: great newsletter, and I love your lighted signs. Can you tell me how these were made? I use witnessing crosses for public evangelism, but would like to make something I can use in the evening. Any info you could share would be great. God’s rich blessings as you labor in your corner of the harvest field. I spoke to Bill Gates patent attorney who is also a former Mormon. He wrote the site www. Formerlymormon.com or org? He is not a Christian yet but very open. He has some amazing things on his site. He suggests when Mormonism started they actually believed in the trinity? [I replied:] That's a matter of debate. For me, it could be understood as the Trinity from the Book of Mormon, but it could easily be understood as Modalism. Then the Lectures on Faith clearly teach that there are only 2 persons in the Godhead--the Father and the Son--and the Holy Spirit is the mind that is shared between them (Lecture 5). Then Mormonism evolved into polytheism with 3 separate exalted Gods who are one in purpose. You use the word Christian in italics. Does the term Christian not refer to the belief in Jesus Christ and that he is the saviour of all mankind? It makes me sad that you would openly criticize another religion that also has a belief in God the Eternal Father and in his son Jesus Christ. I know and can testify that the saviour would not purposefully and hurtfully criticize others as you are the LDS church. i will pray for you all that your hearts may be softened. I have met you at the Manti pageant. Thanks for your great website! Hi Rob! I just wanted to thank you and everyone at Lifeline for making it possible for us all to meet there on Sat. for the conference. It was an amazing time, and I look forward to next year and also being more involved in the planning team too. Count me in!